Ensuring you get the right fit is always important especially when it comes to footwear. You want to make sure that you can feel comfortable wearing them, whether it’s for a short walk or all-day long. With Le Chameau, you can be assured of comfortable and long-lasting footwear designed to support your foot in all the right places. The sleek curves, individual calf sizes and special fits in some styles, means that Le Chameau can offer a truly personalized fit. But it can be a daunting task finding what fits best; Ladies, Men’s, Unisex, size up or size down? Le Chameau have researched and measured many feet to work out the average foot size, and from there, decide style, fitting, comfort and material in order to make the best rubber boots. Here at Philip Morris & Son, we want you to make the right decision when it comes to investing in a pair of Le Chameau footwear so we’ve made this handy guide to help you out. 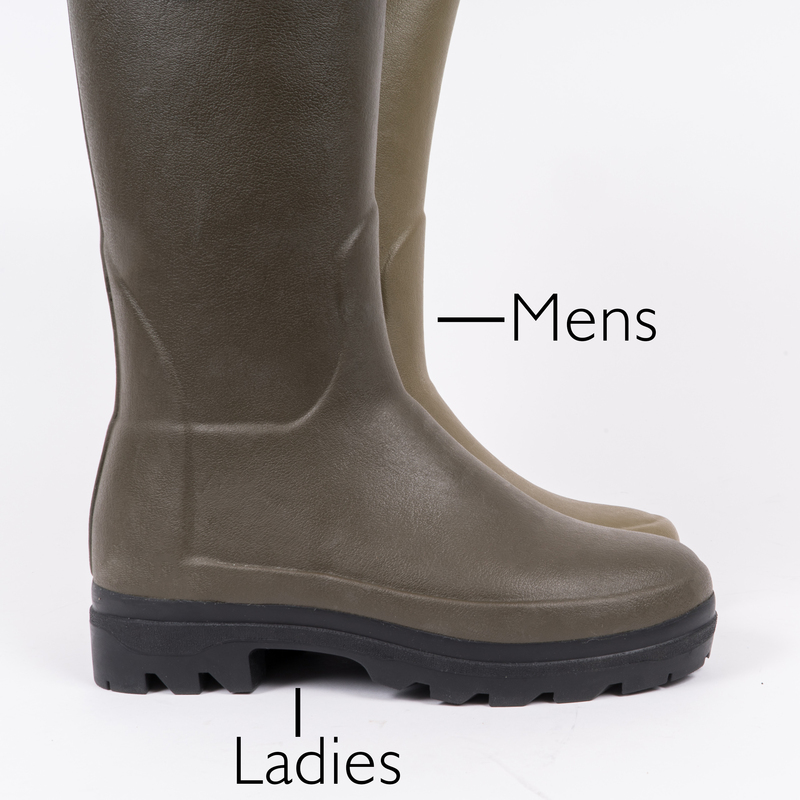 You may have noticed that Le Chameau do 3 styles; Ladies, Men’s and Unisex. Whilst they all have typical stereotypes to their names, it does not mean that you can’t have Men’s because you are a female. Besides no-one will be able to tell the difference! These are simply different variations based on lots of research to get the truest fit, so you can get what is right for you. Whilst the ladies’ footwear looks rather snug, Le Chameau believes that a well and truly fitted pair of boots require the assistance of a boot jack to remove them. You will discover many people comment on how well supported around the foot a pair of Le Chameau boots can be. Furthermore, to add to Le Chameau’s theory, we advise using a boot jack with all footwear to prevent kick damage to the heel and for extending the quality of life for your boots. The biggest difficulty we encounter when finding the right pair of boots for our customers is getting the right calf size and we can assure you that you are not alone! 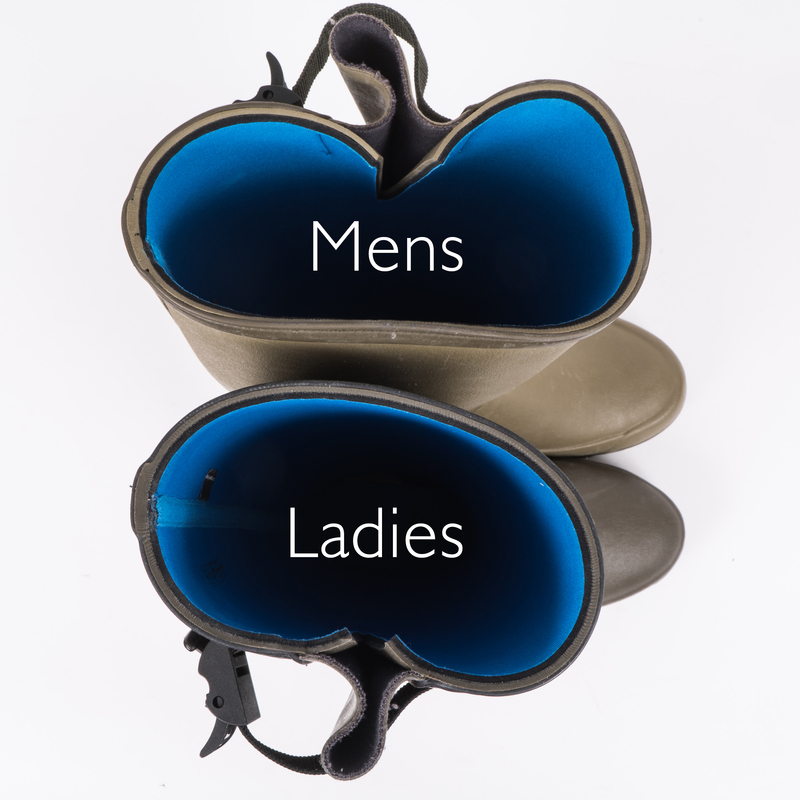 Based on the average foot sizing with Le Chameau, ladies’ footwear tends to have a calf circumference approximately between 37-39cm depending on the boot. Whilst the men’s calf average between 39-46cm. Boots with an adjustable side gusset, like the Vierzonord, give more leeway and support giving you control of the fit. Boots without this feature, such as the zipped Chasseur boots can vary from 41cm, 44cm and even 46cm calf sizes in some styles. Here’s a chart guide providing calf sizes for some of your favourites. If you can’t see the boots you’re looking for then please do not hesitate to contact us and we will be happy to help. To ensure you get the right size, follow these steps for measuring your calf. Take a seat, that’s the easy part! So, you’ve got the right style and calf width now but what about foot size? Le Chameau recommend taking your normal foot size when choosing their footwear. But if in doubt, and you normally take a half size, then it’s better to take the larger size as it will always be more comfortable than a boot that is too small a size. If you’re considering wearing thicker socks, then Le Chameau boots are generous enough to allow these to be worn with your normal foot size. To help make your decision slightly easier you should note that the choice of lining, whether it’s neoprene, leather or cotton, has no impact on the fit and size of the boot. You’ll also notice that Le Chameau footwear come in EU sizes and some styles have different conversions to our UK sizing. Therefore, we advise checking the individual size guides available on our product pages to help get the correct size for you! If our handy guide has helped you decide which boot is right for you, then why not head over to our website where we have a huge range of Le Chameau footwear just waiting for you! If you’re overwhelmed by all this information, then please do not despair! Our customer service team is only a phone call away, so please get in touch and will be happy to answer any questions you might still have. Le Chameau, Le Chameau Boots, Neoprene, size guide, Wellies, Wellington. Bookmark. My calf measures 32cm over jodhpurs and long socks. I think the vierzonord will be too big fir me although I like the style. If too wide at the top hay, shavings, etc get into the boot – this is the problem I am having with my present boots. How tight can the buckle be tightened and still look ok? I love when I’m out in the country, it’s a great reason to wear country clothes. I’ve been recently loving ( https://www.webury.com/ ) They’ve got clothes for men, women and children for country activities.